This show?replaces our previously advertised production of ‘To Kill a Mocking Bird’ which has been cancelled due to unforeseen circumstances. Set just prior to the outbreak of the First World War, Fanny Hawthorn and Alan Jeffcote have been in a Llandudno hotel, having, what would now be called a “dirty weekend”. Dramatically, when their deception is exposed, they find themselves in conflict with both sets of parents. 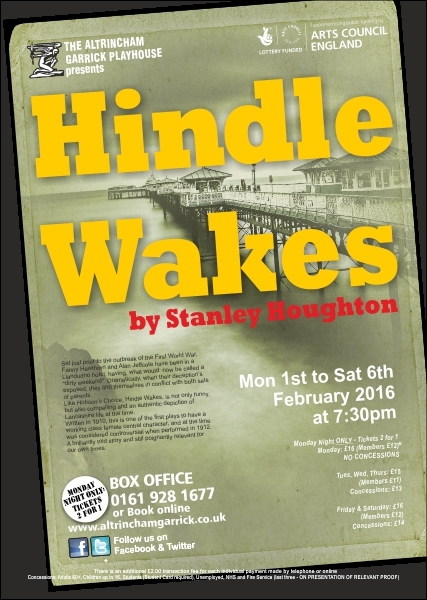 Like Hobson?s Choice, Hindle Wakes, is not only funny, but also compelling and an authentic depiction of Lancashire life at the time. Written in 1910, this is one of the first plays to have a working class female central character, and at the time was considered controversial when performed in 1912. A brilliantly told story and still poignantly relevant for our own times. SHOW UDATE: Some of you may have heard, from last night’s (Friday’s) performance that a member of the cast was taken ill on stage, before the interval, and the show had to be cancelled. The good news is that they have been given the all clear and are planning to go on, tonight, and ‘Hindle Wakes’ will go ahead with the full cast. We understand that plans have been made to refund last nights audience’s tickets if they contact the Box Office – but for those that went last night, free seats should be available for tonight’s show, if they bring along last nights ticket. Please be patient with the Box Office if you are trying to contact them today as they are trying there best to sort out this very unusual situation – thank you.